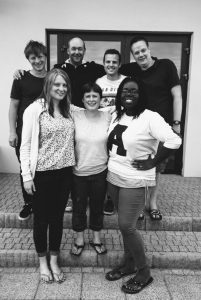 On Saturday 8th July a team of seven from Monyhull Church travelled 1250 miles to the city of Lublin in Poland. We didn’t go for the Pierogi (meat dumplings) or the Pickled Gherkins. We went there to help run a holiday-Bible camp at a special site in the village of Kunow. This was the latest in a series of exchanges that began in 1994. You can read about the history of this link in a previous blog post. This most recent visit began with a brief tour of Lublin on Saturday followed by our participation in the Sunday morning service. On Sunday afternoon we travelled to Kunow and set up for the week. Each day began and ended with meetings in the main hall – with a sermon series on John’s gospel in the mornings and the Beatitudes in the evenings. These meetings were interspersed with introductions, testimonies and lots of singing! There was a separate children’s track running in the mornings with songs and craft activities around the themes of the main talks. Outside of these meetings there was lots of free time to play football and volley ball, go swimming or boating on the local lakes, and enjoy getting to know each other. 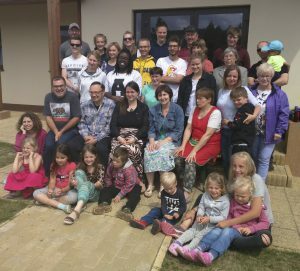 Despite the language barrier it was a great opportunity to serve our friends in Poland and we felt in many ways that we had received more than we had given. Poland is dominated by Roman Catholicism (97% identify as RCs and 60% regularly attend Mass). While this opens up many opportunities to speak about the Christian faith, there is a very powerful loyalty and cultural identification with the Roman Catholic Church. In Britain evangelical Christians are a minority treated with suspicion in a secular culture. In Poland the same is true in a very religious culture. As we face our own challenges, let us also pray for our friends in Poland, that the Lord will give them courage to shine as stars as they hold firmly to the Word of life (Phil 2:16).